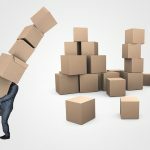 One of the most commonly heard complaints that people lodge when it comes to moving boxes is the fact that a moving box is unable to hold up all the stuff that they put in it. However, before condemning the moving box itself, you need to ask what the person put inside. In an effort to save money and get as few moving boxes as possible, a lot of people buy less than what they need and end up stuffing way too much stuff inside a single moving box. The result is that the moving box gets too congested, and is likely to be damaged. When it comes to moving boxes, you have to respect limits and boundaries. If you don’t, you’ll end up with a damaged box and have to pay even more for it to get fixed. Do yourself a favor and get enough moving boxes to handle all the stuff that you’ll be moving. Another major mishap that can fall on you is the purchase of a low-quality moving box. It is understandable that you want to save money while moving, one thing you should know is that when it comes to moving boxes, you definitely can’t compromise on quality and quality is not cheap (otherwise, it won’t be quality). Quality moving boxes will be the best for you, especially as they help you to move as many items as possible and they are able to last even longer after you’re done with the move. Why would you buy a mattress storage bag for your clothes or buy a wardrobe box just to use it to move your office stuff? A lot of people are of the belief that as long as it is a box, it will be able to move items. However, abuse is the first way to destroy a moving box, and you need to ensure that you don’t engage in this as well. You know what you want to move, right? Then get the appropriate box for it. The solution to this issue is pretty simple; in order to be on the safer side, just make sure to do enough research on the moving box that you’re looking to get. What do you do with your moving boxes when you’re done with your move? The popular response would probably be “discard it”, but moving boxes that are of the highest quality can actually last longer than that. You just have to know how to maintain them properly.